India ended the first day's play of the Domain Test Series on a low note as Cheteshwar Pujara, who scored a magnificent hundred under pressure, was run out for 123. India ended the day at 250/9 with Mohammed Shami batting and Jasprit Bumrah yet to come in. India won the toss and elected to bat first and had trouble right from the start. KL Rahul poked at a late swinging delivery from Josh Hazlewood and was caught at third slip for 2. Vijay looked settled right before he tried to hit the ball too hard and nicked Starc to Tim Paine when on 11 runs. Virat Kohli was dismissed by a great catch from Usman Khawaja diving to his left after scoring just 3 runs. 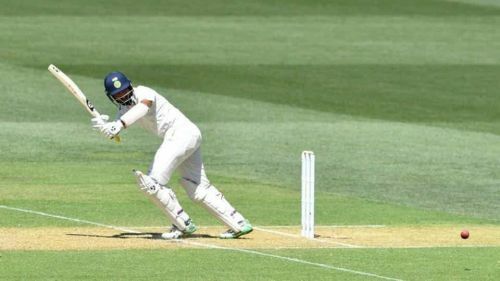 Ajinkya Rahane and Rohit Sharma showed some support to Pujara but both got out playing rash shots, Rahane outside off stump and Rohit a needless heave. Rishabh Pant played well for his 25 and Ashwin defended his wicket well to score 25 runs as Pujara was dodging, defending and hitting the occasional boundary. It was a great feeling when he reached his hundred, India had somehow managed to salvage something from the top order collapse they suffered. India certainly didn't have an easy time out there and here are two lessons they would've learnt. Australia were energetic on the field and always put pressure on the Indian batsmen and India have to do the same if they want to restrict the Aussies. Usman Khawaja took a blinder to dismiss Kohli, probably the most important wicket for them. Pat Cummins effected a brilliant run out in the last over of the day taking Pujara's wicket. Pujara could've added a few valuable runs the next day and Cummins' effort must be appreciated. Their slip fielding was excellent and there wasn't a single drop from them all day. India must have realized that the tour Down Under wasn't going to be a walk in the park and they need to show utmost commitment in whatever they do especially while fielding. The Aussie pace bowling trio was excellent and each of them picked up two wickets. Pat Cummins picked the price scalp of Virat Kohli while Hazlewood dismissed Ajinkya Rahane and Rahul. Both Mitchell Starc and Hazlewood moved the ball well and hit the right lengths. They exploited the Indian batsmen's Achilles Heel, off stump awareness. With disguised inswingers and late swing, their new ball bowling was excellent and energetic and India need to replicate the same form if they want to win.